SKU: PPA01. Categories: Party & Event, Serving Equipment, Punch Bowls. Tags: punch bowl, silver punch bowl. 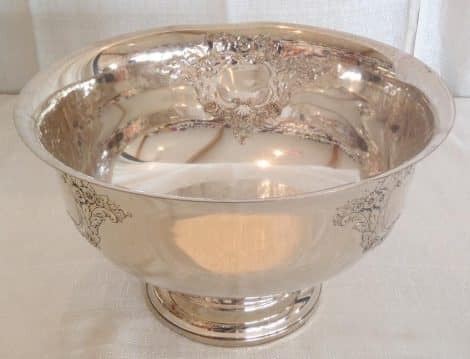 Punch bowl, silver. We also carry silver punch ladles which are rented separately. Please do not use silver items for acidic foods such as salads and fruit salads as the acids will eat away the silver. All dishes come to you you clean and ready to use. All that we ask of you before return is that you rinse the dishes and return them in the crate or box in which it came to you.